I knew the day would come when my kids would start asking for a "real" party. By "real" I mean a party with guests that don't live in our household. I guess having your mom, dad and sister at your party just doesn't cut it when you're turning 7. Honestly I have been dreading having a "real" party because I hate having my house full of noisy sugar fueled kids... because my kids are never noisy or sugar fueled, HA! So I had been dragging my feet trying to put off the party planning as long as possible. Now with the party a less than two weeks away I finally asked EJ to make a guest list, which we narrowed down to 13 including his little sister (they won't all show up right?) The big question was what theme he would like. 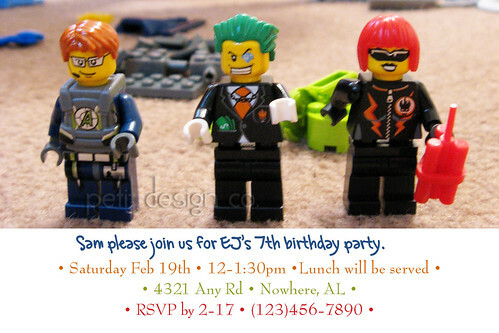 He finally decided on a Lego themed party, and to tell you the truth I'm getting kind of excited to pull it off! Mr. PD is also excited since I already gave him his assignment to build a track for some Lego car races. I simply used a picture that I took last year for my Project 365, cropped it, added some white space, and added the party info. I went ahead and personalized each invite with the name of the guest since I was only making 12. These are sized as 4x6 so I'll just have them printed at Walgreens or CVS. My son is turning 8 in May. Legos are huge in our house. One of his friends had a lego themed party and it was awesome. Mom decorated the table with different legos and spelled Happy Birthday with them. Very cute. The kids were all given a bag of legos and a t-shirt with a lego board velcro'd on it. The kids had a blast designing their lego shirt. There are so my other cool things she found online. Lego shaped crayons, lego shaped candies.